I think liking tea has become a bit of a blogger cliché, along with liking cupcakes, peter pan collars and whimsical vintage prints. I do have the obligatory 'Keep calm...' poster but I genuinely do love tea.. [maybe not as much as Hayley though!] I drink gallons of the stuff when I am at uni (more if I am working to a deadline!) and I like to have pretty mugs to keep my tea in. Last year for Easter, Mark bought me a hand-painted Whittards mug with an Easter egg in the top. When I went to Swindon designer outlet, my first port of call was the Whittards shop and I spotted this little lovely. 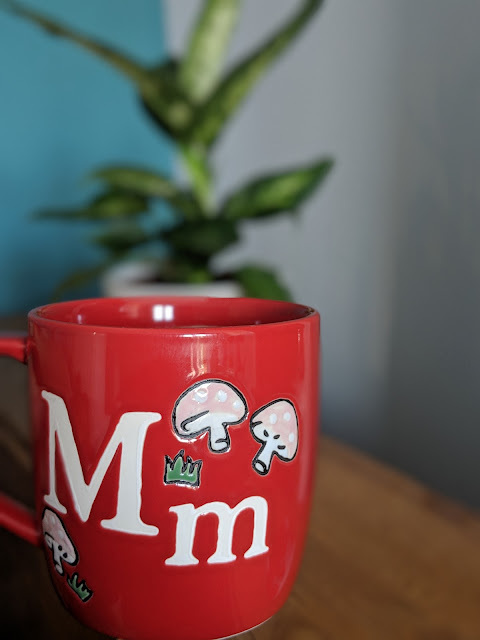 I am a sucker for anything with a cute print and this mug was no exception! I should stay straight off that I am a strong brew, milk, no sugar kind of gal but I have always been curious about more exotic forms of tea. My housemate Lisa has this tea and it always smells amazing so I am excited to try it out! The main reason I picked this up though was the cup, isn't the pattern just amazing?! I also received some free tea from Clipper after seeing Lucy's fab post alerting me to the opportunity. I have been a fan of Clipper since my mum bought me some of their tea for uni but I never tried green tea so I am looking forward to trying that! I swear, barbeques with my family are the nicest way to spend sunny weekends! Some gorgeous burgers and sausages from a local farmers market, caramelised onion cooked on the barbeque and Fab lollies for pudding. There really is nothing better! Our garden looks so pretty at the moment, these ragged edges tulips are everywhere! What have you been up to this week? How do you spend your weekends? I am now craving BBQ, I've not had once since last summer. Uuum sausages! Cute shoes and you're spot on with the blogger cliche what is it with tea and cupcakes? But I do love tea and cupcakes!!! TEA. I love tea, but not so much breakfast tea. Latest addictions include the Dr Stuart's Apple and Ginger that The Guy sent me, Earl Grey- always a fave and Vanilla Red Bush is great too. Unfortunately I have just as bad an addiction to coffee, which is going to be my downfall! and good old PG TIPS! I'm mad about tea! you can sign up on the twinnings site for free tea I think. I have to have English breakfast in the morning and if you want a nice strong cup of tea Assam is lovely. Carlinn- Thank you, I love my cup, it's adorable! Gem- Me too! Whittards is amazing, got to be one of my favourite shops! Mmm delicious! Also can't wait to see the whole outfit, that is one awesome sneak peak! I seem to have a bit of a reputation...hehe! I don't really do loose tea though, too much faff! I'm a green tea freak! Naturally drinks loads a day! Ooh, with green tea you can make my *favorite* cold summer drink--iced green tea lemonade! It's heavenly! Clare- It was probably the best meal I have had all week! Susie- That sounds AMAZING! Do you have a recipe? I love tea! iced tea with peach and lemon is the best! haha so true but I do adore tea and cupcakes to, it has got to be said.